Terri Hargrove, a Fort Smith resident of more than 10 years, fulfilled her goal of opening her own yoga studio on July 1st, 2015. Terri first fell in love with yoga in 2010, she then began her journey of becoming a yoga instructor in January 2012. She attended teacher training in the Bahamas where she received her first 200 RYT Yoga Alliance Certification. In November 2014, Terri completed her second 200 RYT training in Baja, Mexico. During her more than six years of instructing, Terri has taught yoga classes all over the community. She believes that yoga should be available for EVERYBODY. She offers affordable classes and even has a bartering system in place where students can exchange goods/services for classes. She is deeply tied to her community and works to give back in any way she can - currently she chooses a charity each month to donate a portion of class fees. She loves that her path allows her the opportunity to help people feel more connected to themselves and their community. My first yoga class was 7 years ago and it took 3 years to develop into a daily lifestyle practice, but once it did my journey has been an amazing season of growth ever since. The transformation it has had on my own life led me to teaching. I received my 200 hr training at Yoga Gypsy University with Teri Honeysuckle. My passion is healing for the mind, body & spirit, and I absolutely love watching new students grow. I am a massage therapist, and hypnotherapist as well and I bring all my training into my sessions and classes. I am a very hands on teacher and my styles of teaching range from gentle, restorative to upbeat Vinyasa’s. I love sharing tools with people they can use to bring balance to their lives so they can live in the freedom of their true self! I am so grateful to all the people along my path that have taught me so much. Yoga has been a part of Jana’s life for nearly a decade, and has helped her overcome two serious spinal injuries, and the trauma of a life threatening experience while on active duty military. Jana has benefited greatly from practicing yoga during multiple pregnancies and throughout the postpartum period. Jana’s classes are taught in a nonjudgmental and welcoming style. Her classes are focused on quality movement, joint health, and overall increased well-being. Classes are accessible for beginners while still providing a challenge for each individual student. A brief section of positive philosophy is included during class, but it is never dogmatic and completely optional. Jana’s classes implement the ancient wisdom of yoga philosophy in a simple and understandable format. The practices used in classes are rooted in the original tradition, but are geared toward modern understanding, biomechanics, and physiology. Props and modified postures ensure each student feels confident and comfortable, no matter where they are physically. This beautiful soul full of light and love began her yoga journey as a “closet yogi” for 2 years before making the bold move to walk into a class. A couple of years later she realized how deep her love was for the practice and began her journey into teacher training. She is passionate about the outdoors, her new beautiful daughter Everest and finding adventure in everything! She will love you, encourage you and challenge you. Jo Johnson graduated as a Registered Yoga Teacher from the Powered By Heart training at Yogaterrium in January of 2018. As a registered nurse , she has worked in many fields over the last 14 years, including ER, OB/GYN, and Hospice. Jo recognizes the incredible health benefits yoga provides such as improved physical fitness and stress reduction. It is Jo’s goal to continue to learn more about Yoga and it’s sister science Ayurveda, so that she can share her knowledge with the community. Ultimately she hopes to offer services as a compliment to traditional Western medicine, providing more holistic health options for those who seek such guidance. Jo hopes to offer classes to suit every need. Her first class will be Sunrise Power Yoga - a mid level, strength building, flow class, followed by a Family Yoga Series for parents and children over the age of 5 starting in the summer. She can’t wait to share her love of yoga all of you. Meditation began an influence in Keith's life almost fifty years ago. He first became interested in meditation and it's benefits through the study of Hinduism, Buddhism, and Taoism. After a brief immersion in Transcendental Meditation and traditional Buddhist practices, Keith sought out a more academic approach. ​He studied the physiological effects of meditation as described in Benson's work "The Relaxation Effect." Benson's work and it's open minded attitude stuck with him through the years but it wasn't until he studied with a Buddhist monk in Nashville that he saw how his own meditation practice had changed his personal life. Together, they explored Zen Meditations, Mindful Meditation, and Transformational Meditation techniques. ​Though certified as an instructor. Keith considers himself a coach rather that a teacher. Due to his background and exposure to many schools of religious thought, he is drawn to a non-denominational approach to meditation, Regular practice has been beneficial in a number of ways including improved relaxation, enhanced mental focus, coping with anxiety, managing emotional situations , and lowering blood pressure. 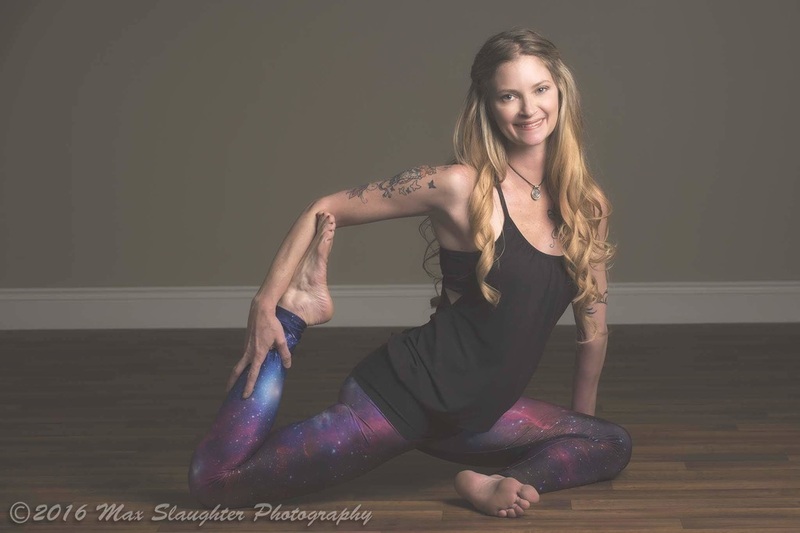 Chloe’ Mims recently transplanted to Fort Smith and was more than delighted to find a like minded yoga community, who think the benefits of yoga can and should be accessible to all. Chloe’ happened into her first yoga class, as a collegiate golfer looking for exercise more suited to flexibility and balance. Though, it wasn’t until eight years later and walking into an Intro to Ashtanga class at Cherry Blossom Yoga in Houston, TX that she fell in love with more than the physical practice and found a love in all eight limbs of yoga. Wanting to share with all not only the physical, but mental, emotional, and spiritual benefits she experienced in the safest and most encouraging ways, she began her teaching journey in February 2017 with Ally Ford Yoga, an Ashtanga based teacher training in Shreveport, LA. In September 2017, Chloe’ was issued her 200 RYT Yoga Alliance Certification. She couldn’t be more excited to share her practice and passion with you. Hello, I am Robert Hutchens. I have been practicing yoga for 3 years now and will be receiving my 200hr Yoga Teacher Training certificate in August. I first started yoga because I was suffering from a stomach condition called H-pylori. I was severely fatigued and mentally exhausted. Yoga helped immensely with my overall energy and digestive system. I became more energized than I had ever been and began to feel relief from my stomach condition. My initial practices were long, slow, and deep. I enjoyed the slow flow of yoga and desired its' steadiness . As my yoga practice developed, I discovered my joy for power yoga. Power yoga enabled me to not only challenge my body but also my mind. I look forward to sharing my passion for a powerful class and motivating others to reach beyond their preconceived notions of what their body can do.